Easily purchase and download our verified Canadian teacher email database and begin contacting educational professionals across Canada today. Start using this ready-made teacher mailing list in minutes, or build your own business contact list with our innovative list-builder tool. Canadian teachers are responsible for providing students with the skills and knowledge needed to thrive in life. Contact these professional educators directly with our accurate and affordable teacher email list. This pre-built business database of premium sales leads contains the contact information of teachers at a multitude of educational institutions all across the country. Using our human-verified Canadian teacher mailing list, you can quickly email leads, connect with your target audience, and increase your sales. This B2B email list not only contains email addresses but also other forms of contact data, such as phone and fax numbers. Our Canadian teacher email database puts you in touch with the right people so that you can close more deals. 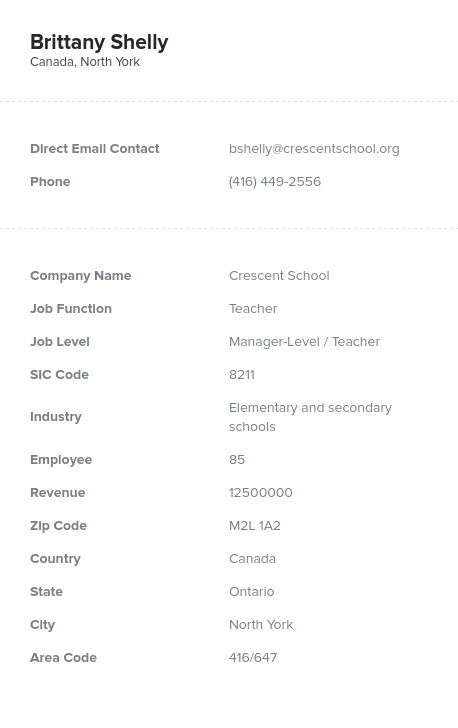 Bookyourdata.com's premium mailing list of teachers in Canada and our business contact list-builder tool are designed to help businesses leverage their marketing efforts. With just a few clicks of the mouse, you can buy and download valuable contact information that includes data from Canadian teachers from all levels of education, or you can filter your list to include only those teachers that you're specifically targeting with a more focused marketing effort. It's never been easier to build relationships with industry professionals. When you purchase email lists, you're receiving an effective business tool that extends your products, services, and solutions to your target audience. Try our game-changing teacher email list and start making connections with the right people today.